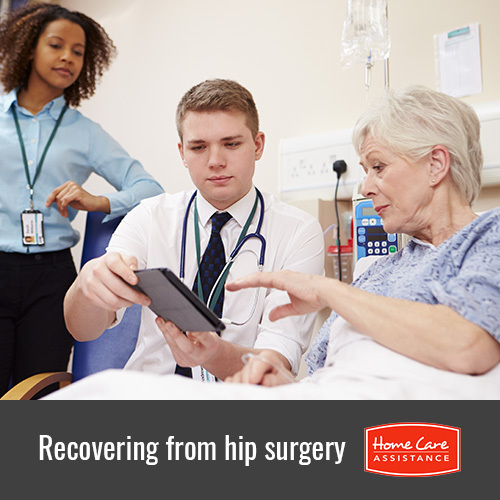 Hip replacement is a major surgery, which requires a senior to spend considerable time in recovery. After the procedure, when your loved one is immobile, Harrisburg senior care experts recommend taking the following steps and precautions. Blood clots are a relatively common side effect of procedures near the waist or thighs. While smaller clots are generally not dangerous if they stay in place, they can become dislodged and injure the heart. Compression leggings are designed to reduce swelling and prevent clots from forming. Depending on your loved one’s general health following the procedure, the leggings should be worn for five to seven weeks. After the procedure, your loved one will need full-time assistance for at least four or five days. Consider hiring a professional caregiver in Harrisburg to assist your loved one. During this time, your loved one will need to remain almost completely immobilized. Designate a comfortable area in a bedroom or living room relatively close to the restroom, and make sure your loved one has snacks, extra blankets, and water within reach at all times. He or she may also need books, magazines, movies, and other forms of entertainment to stave off boredom. The two most common forms of medication given to seniors following a hip replacement surgery are painkillers and blood thinners. Blood thinners are designed to reduce the risk of blood clotting while alleviating uncomfortable swelling. Painkillers should only be taken as needed, and you and your loved one must be careful about the dosage. Mixing painkillers with alcohol or other forms of medication can be deadly and should be avoided. Other common options for pain relief include massages, aromatherapy, and meditation. Even after the hips have healed completely, your loved one must continue to use a walker or cane for at least six weeks. Your loved one must also begin physical therapy as soon as he or she is able to do so. Strengthening the legs and midsection is often an effective way to prevent future injuries. Your loved one will be given a full list of instructions on how to care for him or herself during the recovery, including what types of pads should be placed on chairs and how to bend over without getting hurt. A senior who has had hip replacement surgery will be immobile for some time, after which he or she will have limited mobility. Your loved one may require assistance to navigate the home and complete daily tasks. Consider hiring a professional caregiver from Home Care Assistance to assist your loved one with tasks of daily living such as grooming, bathing, light housekeeping, and meal prep. Our trained caregivers also provide specialized dementia, post-stroke, and Alzheimer’s care Harrisburg families can rely on. Call (717) 540-4663 to discuss a customized home care plan for your loved one and schedule a complimentary consultation.